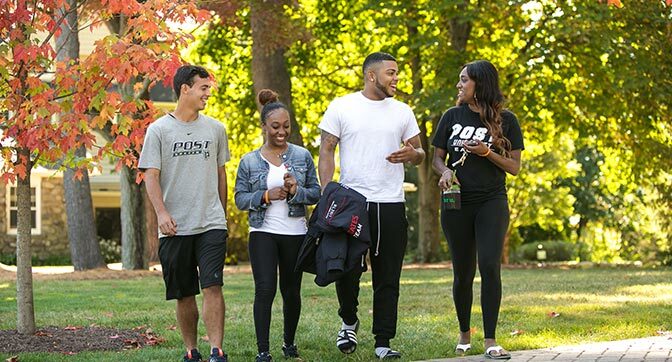 Live and Learn on CampusLiving on campus means you’ll be part of the Post family. You’ll not only meet new roommates and friends, but there’s also a whole community of people here to help you get adjusted to campus life. Post University’s Office of Residence Life is focused on creating a strong and involved community of learners. By living on campus, it is our sincere hope that students will fully embrace their development inside and outside the classroom. Living in a community can come with unique challenges, but amazing rewards of friendship, growth, and connection. The Office of Residence Life seeks to help students reach their full potential, by striving to foster a healthy and safe living learning community. The Office of Residence Life embraces diversity and promotes its vision through individual enrichment and leadership development opportunities. The Office of Residence Life is located on the lower level of the Leever Student Center. Professional Staff; Residence Directors (RD’s) and Building Coordinators (BC’s) live in and oversee all six of our residence halls in order to ensure the safety and well-being of all residents. There is a professional staff member on call 24/7, in conjunction with campus security, to ensure that this safety and security is maintained at all times. Additionally, Resident Assistants (RA’s) live in the halls in order to encourage positive social interaction and enhance students’ co-curricular learning. RA’s are responsible for enforcing policies, acting as a resource and referral agent, and planning and implementing purposeful programming for the residents in their area. Post University permits residents to host guests in the residence halls. Guests are defined as individuals who are not residents of the resident hall they are visiting. Residents are strongly encouraged to communicate with their roommate(s) prior to hosting guests. Post University reserves the right to refuse guest entry and revoke guest privileges for a residence hall, specific floor, and/or individuals at any time. Residents may sign in no more than two guests at the same time. All guests must properly sign-in at the South Gate security kiosk. Failure to do so may result in a Post University and/or police action. Residents are permitted to have short-term guests seven days a week between the hours of 7 am and 11:59 pm. Guests who remain on campus after 12 a.m. are considered overnight guests. Residents may not have an overnight guest for more than three nights in a seven-day period. In addition, residents may host overnight guests no more than six nights per calendar month. This includes other Post University residents and outside guests. Hosts must accompany guests at all times. Guests must carry the issued guest pass at all times and present it when requested. Guests under the age of 16 are not permitted in the residence halls overnight. Guests under the age of 14 are not permitted in the residence halls at any time without the presence of their parent or legal guardian. Guests must abide by all University policies, procedures and regulations, as outlined in the University Catalog and Student Handbook. Residents are responsible for the actions of their guest(s) on campus. There is a no-guest policy in effect during 24-hour quiet hours (this includes, but is not limited to, final examinations and all Post University academic breaks).